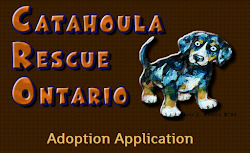 Catahoula Rescue-Ontario: Meet Hooch ADOPTED! Hooch is a sweet, small, young male Catahoula mix, about 1.5 years old. He has a gorgeous red merle coat. He is a gentle, quiet, easy going guy, that would just like to visit the dog park then snooze at your feet. Hooch likes to be near his foster mom and dad and follows them around the house. Hooch isn't a big fan of the snow and cold – as soon as he goes outside, he sits at the door and waits to come back inside! Although that being said, he does enjoy his walks in the snow. 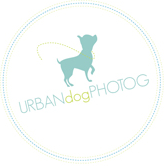 His on-leash manners are quite good – he needs some training, but he doesn't pull and is easily corrected. He responds to his name and knows “Come” - he'll run from one end of the house to the other when he's called. He's learning “Sit” and is catching on quickly. He's crate trained, just needs a little encouragement to go in. He's not at all possessive of his food dish, and takes his treats gently. He hardly squirmed at all when his foster mom clipped his nails. Overall, Hooch is a sweet & friendly boy who just wants someone to love him and help him live up to his potential to be a great dog and companion. Could he be the boy for you?